This film programme presents a broad selection of short films that focus on the meaning of language beyond its verbal articulation. Six international filmmakers explore the way in which language relates us to the world: language is a means of communication, a matrix of behavioural codes and cultural values, an extention of the body and integral to our identity. But what happens to language when it is displaced? Migration can result in the mutation, or mutilation and even muteness of language. Displacement - geographical, social, or gender-related - creates phoney languages, counterfeit codes that negotiate the gap between the familiar and the foreign. Phoney Language also refers to the central role the telephone (the ‘far sound’) plays in some of the films. The screening is curated by Florian Wüst and Maxa Zoller and accompanies All that remains... the Teenagers of Socialism which runs at Waterside Project Space from 12 March to 11 April 2010. The screening will be followed by a Q&A with Ştefan Constantinescu, Nana O Ayim, Zuzanna Janin, Florian Wüst and Maxa Zoller. Contributing to the advent of the New German Cinema of the 1960s, Bernhard Dörries’ Algier Report impresses by its experimental style mixed with documentary authenticity. The film shows the loneliness of an Algerian immigrant who continues to feel at risk and persecuted in West Germany. While he struggles for a residence permit, images from his past enter his mind. Troleibuzul 92 shows a man on a trolleybus talking in Romanian to his wife or girlfriend via his mobile phone. The violence of this conversation, in which the man threatens his partner in the most aggressive way is translated via subtitles, which places the film viewer in a paradoxical position: the advantage of understanding a foreign language turns into a weakness as the viewer becomes a direct, yet helpless witness of abuse. Based on the poem A Shred of Identity by Zimbabwean novelist and poet Dambudzo Marechera this film explores the notion of a double identity in two ways: the split between the self can be interpreted as a product of colonialism, migration and displacement, where the mother tongue mutates into a foreign language. Double consciousness, however, is also at the heart of the creative act; artistic practice could be seen as a constant exploration of the tension between inner and outer self. Majka from the Movie is an art-serial based on the popular 1970s Polish television series Szaleństwo Majki Skowron (Madness of Majka Skowron), which starred the artist Zuzanna Janin as the title character. In the original series, the young rebel Majka is on the run - away from home, towards unknown adventures in Socialist Poland. In the new version, a contemporary Majka is projected into our present condition of a global world that has been cut and pasted together with found footage material and digital sequences. But Majka is speechless and muted, hardly communicating. This film playfully explores a fragile subjectivity that is yet outside language. “You know that every film has its own language… (subtitled original).” Appropriating an ostensibly found language lesson and playing with queer stereotypes in film, Michael Brynntrup’s Love, Jealousy and Revenge delves into the riddle of language, communication and desire through a cleverly amusing portrayal of a telephone call between a man and a woman. 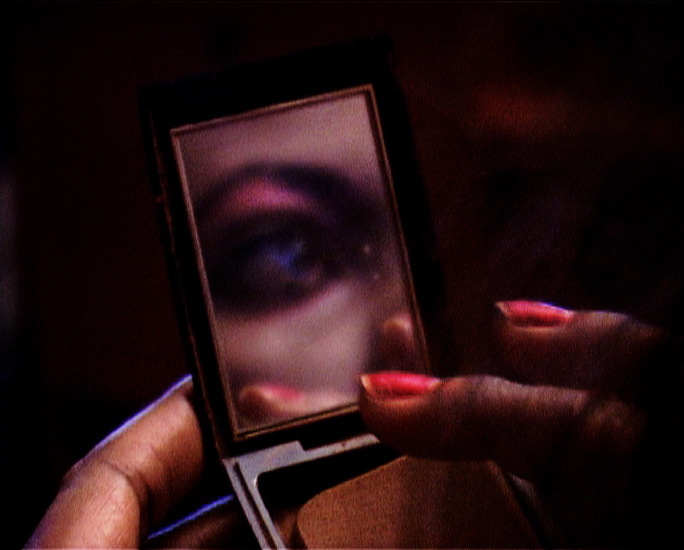 Intimate close-ups conceal faces but reveal sordid circumstances in One Day, Ditte Haarløv Johnsen’s complex and highly sensitive documentary about a West African woman working as a prostitute in Denmark. She finds both solace and sacrifice through her cell phone, connecting with the family and her daughter she hasn’t seen in six years, yet always remaining available to clients. Waterside Project Space is supported by the National Lottery through Arts Council England. The screening is generously supported by the Romanian Cultural Institute London and is organised in collaboration with no.w.here.